At Tonerfabrik™ it is not necessary to order the complete 4 compatible toner colors . We offer a big variety of possible combinations. However, our Sets always include all four colors (C/M/Y/Black). When ordering a combi-set, you may select any 2 different refill toner bottles of the 4 basic colors at an attractive price. 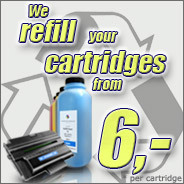 Aswell we offer you 1 kg giant-size packs and our refurbished toner cartridges here which are compatible with the printer.